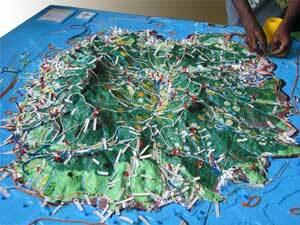 1:10,000 scale model of Ovalau Island, Lomaiviti Province, Fiji Islands, (April 2005). The model (52,800 ha or 528 km2) includes terrestrial and coastal ecosystems and will be used by the local communities for developing resource management, tangible and intangible cultural heritage preservation and development plans. The blank model has been constructed by 30 students and 5 teachers from the Delana Methodist High School and Levuka Public School with the assistance of 15 facilitators/ trainees from the organisations listed below. In 2007, two years after the completion of the 3D model, Ovalau islanders achieved quite a lot: they developed an island-wide natural- and cultural resource use management plan which was followed by 3 district management plans. Marine protected areas (known as taboo areas) were established within the fishing grounds of 3 districts comprising 16 villages. Additional taboo areas were set up by 10 villages on a nearby island partially included on the 3D model. On the terrestrial component, residents cleared ceremonial pathways which were overgrown and planted trees. The Provincial Council reported that building on the existence and use of the 3D model and derived maps, the voice of the community has been more authoritative in negotiation processes. Model making and related follow-up activities have cemented relationships among different districts and sparked an island-wide collective vision for safeguarding biological and cultural diversities. In July 2007 the visit of UNESCO’s director for World Heritage Sites (WHS) resulted in reconsidering the submission done by the Government of Fiji for the inclusion of Levuka City on the tentative WHS list. 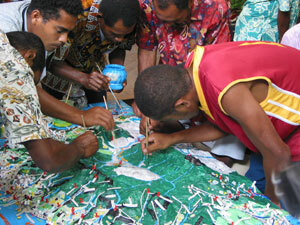 In November 2007 the P3DM exercise done in Levuka town and covering the entire island of Ovalau was granted the 2007 WSIS World Summit Award in the category e-culture. In 2015 an impact assessment conducted by CTA, gathered evidence of improved fish catch (number and size) in coastal waters and agricultural production on the island.